KHB-Zine, Issue #20: Is modular an OB alternative? Welcome to the September 2018 edition of KHB Ezine. Is 'Modular' construction an Owner Builder alternative? Modular homes are built in factories, under cover, before being transported, partly or fully built, to your prepared site. They were originally intended to be 'purpose built' options, for example, holiday park cabins, granny flats etc, but have now become more flexible in their designs. 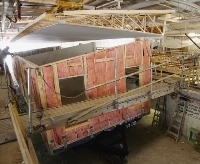 Their many names can be confusing: modular, pre-built, pre-fab, transportable, relocatable, but all generally use the same off site assembly technique. If the house is bigger than a semi-trailer, it will be delivered in modules, which are fastened together on site. There are many advantages for the owner builder to consider regarding modular construction, but also disadvantages, so let's look a little closer. Modular homes are built to withstand strong winds due to the transportation to site, as well as the elements that their location is subject to. Because they’re built in factories, they’re arguably better built than onsite homes as manufacturers can ensure that floors, walls and ceilings are square, and aligned and they’re able to use custom tools that aren’t available on a building site. They use efficient under cover production facility that ensure there are no delays from inclement weather or shortage of tradesman and you don’t have to worry about the building materials disappearing off the building site. Your home arrives on site (around 20 weeks after council approval) – fully plumbed and wired, with kitchens and bathrooms fully appointed in the construction facility, as well as fully painted. It gets manoeuvred into position where the final onsite construction and service connection can be completed. So, as an owner builder, a modular home has it's value. As it is being built, you can be busy with footings, water tanks, waste water setups, fencing, landscaping, garages and other service provisions. Then after delivery, hook it up and shazam. But let's have a look at what may be the disadvantages. First and foremost, most modular homes are designed for piers. Few providers have 'built for slab' otions. Modular homes need space under the home for electrical, heating and cooling, and plumbing connections; therefore, the foundation type must include space between the subfloor and the ground, so the home cannot be built on a slab foundation. For the same reason, modular homes are not designed to accommodate brick or stone. Also because it would be too heavy to transport. They can, however have the modern facades of stone etc available now. Weight problems also prohibit concrete tile roofs. As they are fully built, including kitchens, bathrooms, electrical, plumbing, and paint, they are much more expensive than a similar spec kit home, but that is to be expected. So as an owner builder who doesn't want to do the actual building part, or organise the trade workers to install kitchens, bathrooms, electrical and plumbing, this is an excellent option. Austam Homes, Westbuilt Homes, Hunter Valley Homes, Archiblox, Anchor homes, Australian Modular Homes, Habitech Systems, Prebuilt Prefab Homes, Modscape, East Coast Village Homes, Swanbuild, Austam homes, Ecoliv, Parkwood Homes, Maap House, Uniplan Group, Prominda Building Systems, HiTech Homes, Pindan Homes ,TR Homes, MiShack, Taylor Made Buildings. Download your free PDF version HERE and use your personal password khb1321 (lower case letters-expires in 7 days). If you miss out just contact me. Are you looking for a fantastic, full experience description of completing a steel framed kit home, from beginning to end? 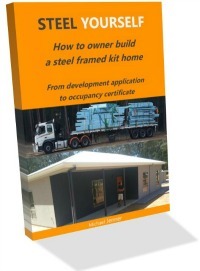 Steel Yourself is an ebook with excellent graphics, diagrams, submissions and material lists to assist an owner builder to navigate the journey of kit home owner building. 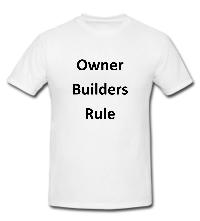 I will prove to you that any owner builder can plan, submit, build and finish a steel building kit home project. Remember, if you have any questions, have an article or submission, or would like to comment or on or review a kit home, provider or design, please contact me, I'm happy to publish your submissions, reviews and experiences about kit home building and the projects surrounding them.